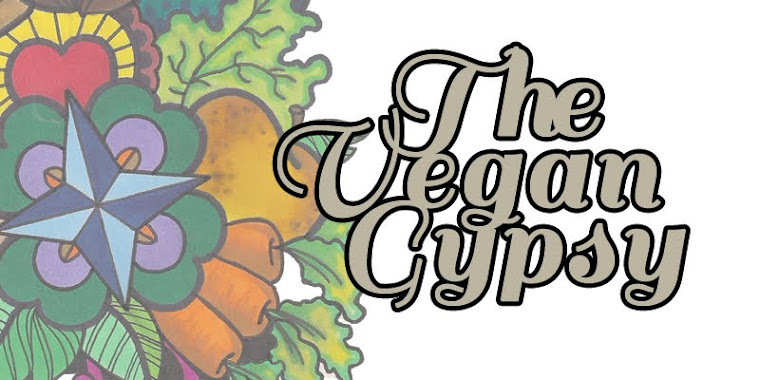 The Vegan Gypsy: On My Hearth: Thai Food Eat-In! Last night I was in the mood for Thai food, but didn't want to spend too much money and calories on the restaurant version. A quick search led me to this recipe, and allowed me to use up one of the "mystery ingredients" I have in my freezer: green peas. I often make a dish that calls for a cup or so of peas, but not the whole bag, and since they aren't my absolute favorite vegetable, I never eat them on their own. So, I end up with little half-eaten bags of them in my freezer, forgetting their existence when I go to make another pea-required recipe! This would be considered is a yellow curry, I guess, with a splash of green thrown in. I happened to have all of the ingredients on hand, always a plus! Sorry that I don't have any pretty pictures of the finished product because, once again, by the time I ate dinner it was too dark to capture one. However, here's the tofu & onions being sauteed, isn't that a gorgeous golden color?! Please note: the original recipe states that "Red curry paste can be found in the ethnic or gourmet sections of most large supermarkets. The paste is a blend of clarified butter (ghee), curry powder, vinegar, and other seasonings" which is not accurate. Not all curry paste contains clarified butter and, as a matter of fact, the most commonly available brand, Thai Kitchen, is vegan. Place a large nonstick skillet over medium-high heat. Add tofu; cook until liquid from tofu is evaporated (about 3 minutes). Remove tofu from pan; sprinkle with lime juice, turmeric, salt, and pepper. Heat oil in pan over medium-high heat. Add onion; sauté 5 minutes. Add tofu, and cook 7 minutes or until golden. Combine milk and curry paste; add to pan. Reduce heat, and simmer 3 minutes. Add peas and tomato; cook 2 minutes. Serve over rice. 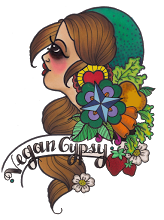 Vegan Gypsy says: Very tasty!! I will warn you that unless you like your Thai really spicy (probably 3 stars), you should stick to one Tablespoon of curry paste. I used two and it had quite a kick! OmniHunny says: I don't know, didn't taste it, she made me something else. Yes, that's right. Chip is not a fan of curry so I cooked him a completely separate meal which I will share with you later. Off to do some laundry, have a great day! Thanks for the recipe. Thai food is one of the best cuisines in the world. I love to eat Thai food often because it is very delicious and healthy.